Seeing whales and dolphins in the wild, where they belong, can be an exhilarating, moving and even life-changing experience. “Over the past 25 years or so, I have been privileged to see whales and dolphins - and let’s not forget porpoises! - all over the world. Highlights include meeting blue whales, sperm whales and spinner dolphins off Sri Lanka; orcas off Vancouver Island, Canada; humpbacks and fin whales off Cape Cod, USA; bottlenose dolphins off Scotland’s Moray Firth, minke whales off Iceland and dusky dolphins off New Zealand. Some encounters have been more memorable, but each one has left me with a huge grin on my face. Because this is the gift that whales give us: meeting them is enchanting, fascinating and often life-changing. Whale watching is great fun and as long as it is carried out responsibly, benefits everyone: watchers, operators and local communities - and of course, the whales, dolphins and porpoises who are, the stars of the show! Responsible whale watching is great . . . Allows watchers to enjoy the spectacle of whales and dolphins in their natural environment, rather than in a tank. It is ALWAYS better than going to a dolphinarium! Offering a long-term marine tourism activity: many whale species are long-lived and, if treated responsibly, may be viewed in the wild over several decades. It’s possible to watch whales and dolphins without leaving dry land (perfect for those who want to avoid seasickness!). We recommend viewing from cliff tops and other vantage points whenever possible as this reduces the likelihood of whales and dolphins being disturbed. There is no such thing as a typical trip, they vary enormously depending on location, the whale or dolphin species in the vicinity and the type of vessel used: these range from huge cruise ships, to small yachts and even kayaks. Whale watching is big business - latest figures show that over 13 million people a year are taking a whale watch trip in over 120 countries and generating a whopping $2.1 billion per year in total revenues! Why is it important that whale watching is carried out responsibly? In recent years, concerns have been raised about the industry’s impact upon whales and dolphins, whether at individual, group or population level. In many cases, whale watching involves targeting specific whale and dolphin communities for prolonged, often close-up, encounters. As the demand for more frequent encounters increases, it is the responsibility of us all to ensure that we are not unintentionally harming whales and dolphins in the process. How to choose a good whale watch trip? WDC receives many requests from supporters seeking advice on whale watching. Whether you are planning the trip of a lifetime to see whales in Antarctica or Australia, or just want to take a half-day excursion the on your holiday in New England, Iceland or Tenerife,: you will probably be faced with a bewildering choice of whale watch tours! It can be difficult to know which one to choose. It is important to recognise that a good trip is one which is not only enjoyable, educational and safe for the passengers, but also treats the whales and dolphins being watched with care and respect – and this means minimum intrusion. The welfare of whales and dolphins is key so we support ‘no-go’ zones and respite periods during the day when no tours are permitted, to give whales and dolphins some respite from continuous targeting by vessels. Whale watch operations are usually commercial ventures and those operators offering a sub-standard service rely on passengers choosing indiscriminately and just getting on the first boat they see. So, before you book a trip, do some research and make sure that you are happy with what is on offer before you get on board! This means careful and responsible boat handling. We are uninvited guests in the whales’ world and we are privileged to see them. We have a responsibility to cause as little disturbance as possible. It is always tempting to try to get as close, especially if you are taking photos. But remember: they are truly wild and constant disturbance can seriously affect their ability to feed, rest and rear their young. In fact, careful and considerate behaviour around the whales usually results in much longer encounters with them, plus the added bonus of observing more interesting and natural behaviour. In some parts of the world, there are regulations governing whale watching with legal enforcement. Elsewhere, there may be a voluntary code of conduct, relying on the goodwill of operators. Worse still, there are areas where whale watching is completely unmanaged, with nothing to prevent irresponsible operators from harassing whales and dolphins in an attempt to get their passengers close to the whales as quickly as possible. It is a good idea to find out whether any regulations or voluntary codes apply in the region. Ask the operator some questions to show that you are aware of regulations and don’t be afraid to speak up if you feel that a vessel is not being handled responsibly. A safe whale watch boat should have an experienced skipper and crew, with appropriate training, licensing and safety equipment. The trip should include a safety briefing for all passengers. This means honest advertising of what passengers can expect from the trip. This may include offering a “sightings success rate” but this should be realistic as, with few exceptions, it is virtually impossible to guarantee sightings on every trip. Every aspect of the trip should be professional, including punctual departures; the vessel should be clean and the crew friendly and polite. If a trip has to be cancelled due to adverse sea and weather conditions, find out whether there is a policy of offering free places on a future trip. This is really important and can really enhance the trip and make for a really memorable experience! Choose a vessel which offers some form of educational commentary – larger boats may employ a trained naturalist but on smaller boats, the skipper may also act as the guide. It can be difficult to positively identify a whale or dolphin which is some distance away and here, the trained eyes of the guide will help you to identify that “small black fin to starboard”. The guide will also be able to interpret the behaviour of the whales and dolphins being observed and this can really add to your understanding and enjoyment of the experience. On some boats, the naturalist-guide may also use the vessel for research activities, such as logging sightings and conducting photo-identification studies. Sometimes passengers may be able to assist with these. Do join in if you can as this adds a new dimension to the experience and is also an excellent way of learning and feeling more involved. A good operator realises that ongoing research can benefit their business by providing a continually expanding source of knowledge on the local whales and their daily and seasonal movements. Some companies also donate a percentage of profits to organisations like WDC. Dolphin SMART promotes responsible viewing and stewardship of wild dolphins and currently has participating operators in Florida, Alabama and Hawaii. WHALE SENSE is offered to commercial whale watching companies in the Northeast US and Alaska. See A Spout, Watch Out! is offered to recreational vessel operators in Northeast US. Across the globe, WDC promotes opportunities for watching whales and dolphins from land, where possible, as this can be a wonderful – and generally non-intrusive - viewing method. 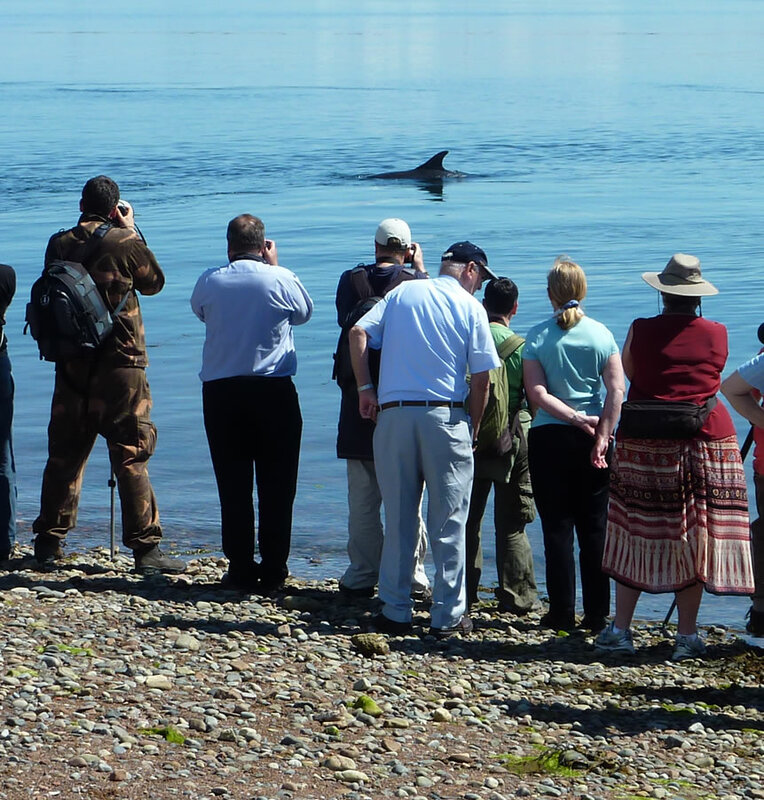 It also offers the chance for the public to get involved in citizen science, such as our Shorewatch programme in Scotland. WDC runs training workshops for operators and onboard naturalists: for example, in the Azores, Central and Latin America, Iceland, Japan, Scotland, Sri Lanka, Tenerife, Thailand and the US. We create educational materials and presentations for passengers and whale watch naturalists in many different languages and regions. WDC experts encourage and assist official agencies to employ “best practice” when drawing up or revising whale watch regulations or guidelines, including adequate monitoring and enforcement provisions. We work in Sri Lanka with partner organisations to promote responsible watching of blue whales and other species under our Project BLUEprint initiative. By supporting WDC, you can help us ensure generations to come have the opportunity to enjoy watching these amazing creatures by protecting them and their homes.